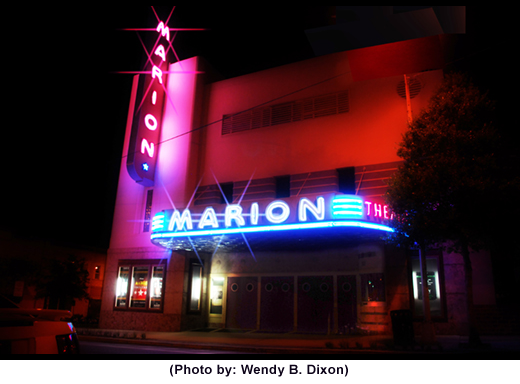 Ocala is the largest city in Marion County, Florida as well as the county seat. 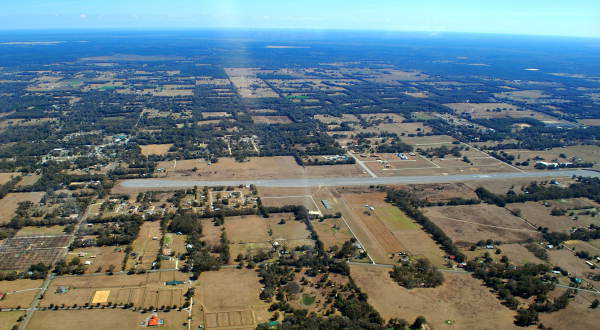 As of the 2013 census, Ocala’s population was estimated at 57,468, making it the 45th most populated city in Florida. Archeological investigation has revealed that the area known at Ocala was inhabited by varying cultures of indigenous peoples from as early as 6500 B.C. The Spanish Hernando de Soto's expedition recorded Ocale in 1539 during his exploration through what is today the southeastern United States. In the late eighteenth and early nineteenth centuries, Creek people and other Native Americans, and free and fugitive African Americans sought refuge in Florida. The Seminole people formed. In 1821 the United States acquired the territory of Florida. After warfare to the north, in 1827 the U.S. Army built Fort King near the present site of Ocala as a buffer between the Seminole, who had long occupied the area, and white settlers moving into the region. The fort was an important base during the Second Seminole War and later served in 1844 as the first courthouse for Marion County. The modern city of Ocala, which was established in 1846, developed around the fort site. Greater Ocala is known as the "Kingdom of the Sun. Ocala was an important center of citrus production until the Great Freeze of 1894–1895. Rail service reached Ocala in June 1881, encouraging economic development with greater access to markets for produce. Two years later, much of the Ocala downtown area was destroyed by fire on Thanksgiving Day, 1883. The city encouraged rebuilding with brick, granite and steel rather than lumber. 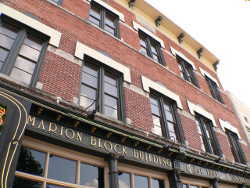 By 1888, Ocala was known state-wide as "The Brick City". The first thoroughbred horse farm in Florida was developed in 1943 by Carl G. Rose, who had come to Florida in 1916 from Indiana. In 1943, Rose bought land along State Highway 200, at $10 per acre, which became Rosemere Farm. The next year one of his horses, Gornil, won at Miami's Tropical Park, becoming the first Florida-raised thoroughbred to win a Florida race. Rosemere Farm was sold long ago, the large site redeveloped for the Paddock Mall and the College of Central Florida. In 1956, the Ocala-area Thoroughbred industry received a boost when Needles became the first Florida-bred to win the Kentucky Derby. In 1978, Marion County-bred-and-raised Affirmed won the Triple Crown. Today, Marion County is a major world thoroughbred center with over 1200 horse farms, including about 900 thoroughbred farms, totaling some 77,000 acres. Ocala is well known as a "horse capital of the world." 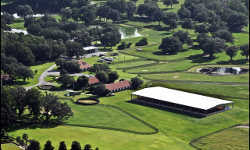 Ocala is one of only five cities (four in the USA and one in France) permitted under Chamber of Commerce guidelines to use this title, based on annual revenue produced by the horse industry. 44,000 jobs are sustained by breeding, training, and related support of the equine industry, which generates over $2.2 billion in annual revenue. 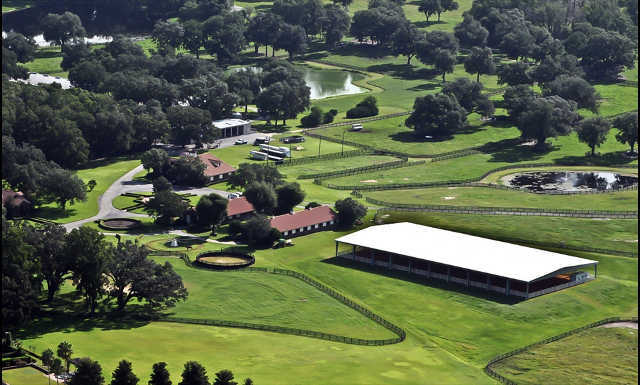 "Postime Farms" and Ocala serve as host to one of the largest horse shows in the country: H.I.T.S or "Horses in the Sun", a Dressage/Jumper event lasting about two months which generates some 6 to 7 million dollars for local Marion County economy each year. The show features classes for over 100 different breeds, including Tennessee Walker, Paso Fino, Morgan horse, SaddleBred, Draft horse and the American Quarter Horse. Other equine events in the area include cowboy mounted shooting by the Florida Outlaws, as well as endurance rides, barrel races, "extreme" cowboy events, jumper shows, trick shows, parades, draft pulls, rodeo events and more. The nearby community of Silver Springs developed around the Silver Springs, a group of artesian springs on the Silver River. In the 19th century, this site became Florida's first tourist destination. Today well known for glass bottom boat tours of the area, Silver Springs is owned by the state of Florida and incorporated into Silver Springs State Park in 2013. 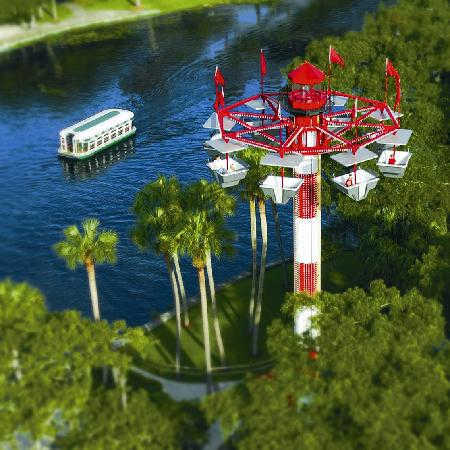 Other nearby natural attractions include; the Ocala National Forest and the Florida Trail. Manmade local attractions include Wild Waters water-park near Silver Springs. 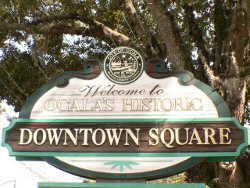 Today, Ocala’s historic downtown square is a hustling, bustling center for business and entertainment and dinning. Adjacent to the Ocala Chamber of Commerce offices are many office buildings housing attorneys, banks, jewelers, Realtors, an adverting agency, even a radio station. 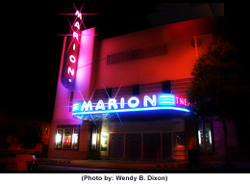 The historic Marion Theatre has been entertaining crowds for over 70 years. The nearby Starbucks is also a popular gather place. Countless restaurants and pubs including a sushi restaurant, steak house, melting pot fondu, Mexican, pizza, French restaurant, gourmet shops, and night clubs surround the historic square.